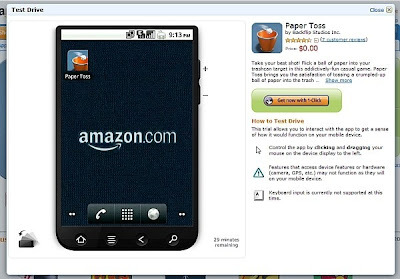 Amazon has introduced a new platform where Android users can test their apps directly from app store before buying any app of android. Today in any App stores it’s really hard to take a test drive of any particular app so if you purchase an app that you do not like or want then there is a little chance of being able to return it. In most cases, you can’t even try a demo version of the application, so what did Amazon do? They have actually created a virtual machine that allows app users to test out any app from their store in your browser before you buy it. Amazon more said that; App Test Drive feature is a great solution to an issue that end users currently face. The one downside to Test Drive is that you have to be at a PC and it currently does not work if you are browsing on your mobile device. Amazon has already launched its AppStore for Android users. It will help users to take a Test Drive of any Android App within their Appstore. In a market where features drive consumers, Amazon has unleashed a top notch product that may draw users away from Google's own Marketplace.